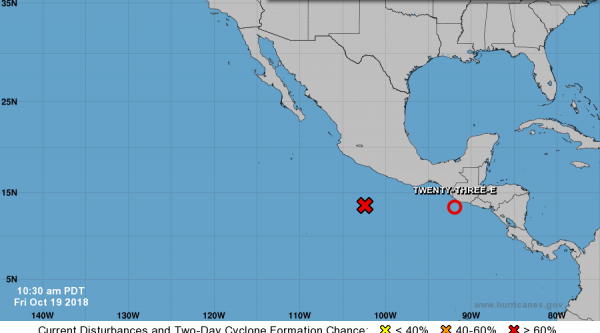 The National Meteorological Service (SMN) reported that tropical depression 23-E formed at 10:00 am in the low-pressure zone located in southern Guatemala, which will cause intense storms in Chiapas and Oaxaca. According to its most recent report, the body dependent on the National Water Commission (Conagua) explained that the natural phenomenon was located 170 kilometers south-southeast of Tapachula, Chiapas. The storm causes winds of 55 kilometers per hour, with gusts of 75 kilometers per hour and maintains a displacement to the west-northwest at four kilometers per hour. For this reason, intense storms are expected in Chiapas and Oaxaca, as well as waves of two to three meters and possible waterspouts on the coasts of those states. SMN urged the population of these entities to take extreme precautions and to be alert to notices from the corresponding authorities, both federal and local. This is because rainfall can cause mudslides, landslides, overflows of rivers and streams, effects on roads, as well as floods in low areas and saturation of drains in urban locations.